Four leg series metal domes (4-leg tactile metal domes, cross metal dome) are four-legged dome designed specifically for mounting on single or double sided PCB, flex circuits and membranes, where traces of negative and positive can designed under the dome on the same side of circuits. It has better clicking fee than Circle and Oblong series dome, and longer life cycle than Triangle dome. Its normal life times are >= 1 million. The height of it is higher than other domes, based on the same diameter, force and clicking ratio. Also the cost is higher than others. The size of F series metal dome is from 5mm to 20mm in a range of (trip) force, typical 125- 500 gf. The trip force, rebound/return force, click, travel, and height, etc., can be adjustable according to clients' request. No matter what size or force you require, we'll do our best to produce it. Contact us now for more! We not only pack metal dome in normal bulk, but also can put each dome on a array and with Adhesive tape on its top, so that you can just peel off each piece and put it on key location of Keyboard/FPC/PCB. 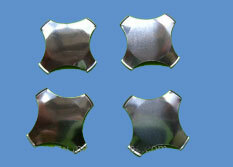 For more information, please see single key dome array, or visit our blog.